This high energy magnet material allows reduced size and weight of magnetic product while providing the greatest resistance to demagnetization. 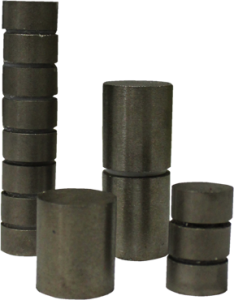 SmCo magnets are available in a number of different grades for a variety of applications. SmCo magnets are brittle and the use of diamond tools are recommended for machining. Machining should be performed prior to magnetizing. SmCo is mechanically weak but magnetically strong with greater Heat Resistance than Neodymium. All Grades, Sizes and Configurations are available.